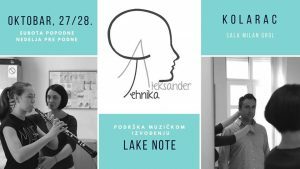 Alexander Technique Studio at Kolarac has the honour to invite you to a two-day course LAKE NOTE for music performers. The seminar will be held on Oct. 27th and 28th. Sign-in now! Topics covered at the course will be as follows: balance and support, coordination, breathing, using hands and legs, fostering of senses and attention in order to improve musical interpretation. Presented in a clear and concise manner, these information can be helpful in identifying physical constraints that interfere with the musical expression. They can also present strategies for recovery from stress and injuries.